Toto founding member Steve Porcaro has announced he’ll release his first solo album Someday/Somehow on June 10. 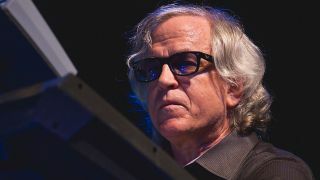 The keyboardist and composer first started working on the track Back To You, the first song he wrote for the album, in 1983. Porcaro says: “I’ve always been writing and recording over the years, hoping to find homes for these songs with other artists. The album features Porcaro on lead vocals for seven tracks and guest singers Michael McDonald on Swing Street and Night Of Our Own, Jamie Kimmett on She’s So Sky and Face Of A Girl, Michael Sherwood on Make Up and Mabvuto Carpenter on Painting By Numbers. Longtime collaborator Marc Bonilla, along with fellow current Toto colleagues Steve Lukather, Lenny Castro and Shannon Forrest, make appearances on the record as well. In March last year, Porcaro’s brother and former bassist Mike died aged 59 after a struggle with Lou Gerhig’s disease. Later that month Toto released XIV, their first album in nine years. Someday/Somehow will be released on June 10 and can be pre-ordered via Toto’s official webstore.